1. What should be the impedance of a low-pass filter as compared to the impedance of the transmission line into which it is inserted? 2. 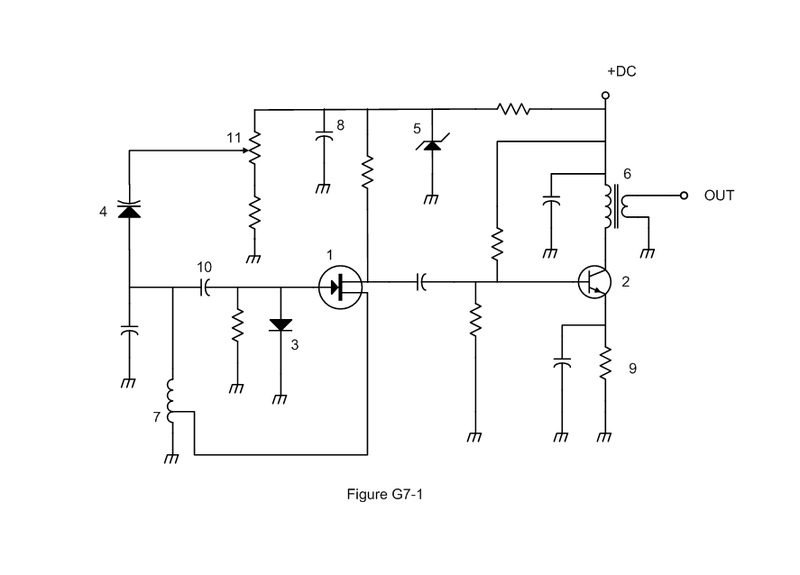 Which symbol in Figure G7-1 represents a solid core transformer? 3. Where should the radial wires of a ground-mounted vertical antenna system be placed? 4. What prosign is sent to indicate the end of a formal message when using CW? 5. When must you add the special identifier "AG" after your call sign if you are a Technician class licensee and have a Certificate of Successful Completion of Examination (CSCE) for General class operator privileges, but the FCC has not yet posted your upgrade on its website? 6. What is the total bandwidth of an FM phone transmission having 5 kHz deviation and 3 kHz modulating frequency? 7. Which sideband is most commonly used for voice communications on frequencies of 14 MHz or higher? 8. Which of these connector types is commonly used for audio signals in Amateur Radio stations? 9. Why should an amateur operator normally avoid transmitting on 14.100, 18.110, 21.150, 24. 930 and 28.200 MHz? 10. Which of the following causes opposition to the flow of alternating current in an inductor? 11. What is the modulation envelope of an AM signal? 12. How does the gain of two three-element, horizontally polarized Yagi antennas spaced vertically 1/2 wavelength apart typically compare to the gain of a single three-element Yagi? 13. What is a characteristic of skywave signals arriving at your location by both short-path and long-path propagation? 14. What is the maximum symbol rate permitted for RTTY or data emission transmissions on the 10-meter band? 15. How much must the power output of a transmitter be raised to change the S meter reading on a distant receiver from S8 to S9? 16. Which ionospheric layer is closest to the surface of Earth? 17. For which of the following modes is a Class C power stage appropriate for amplifying a modulated signal? 18. What does the K-index indicate? 19. Which communication system sometimes uses the internet to transfer messages? 20. What are the stable operating points for a bipolar transistor used as a switch in a logic circuit? 21. What is the output PEP from a transmitter if an oscilloscope measures 500 volts peak-to-peak across a 50 ohm resistive load connected to the transmitter output? 22. What type of device is often used to match transmitter output impedance to an impedance not equal to 50 ohms? 23. Why is it best NOT to draw the DC power for a 100 watt HF transceiver from a vehicle's auxiliary power socket? 24. What is the total resistance of a 10 ohm, a 20 ohm, and a 50 ohm resistor connected in parallel? 25. What action results from a failure to exchange information due to excessive transmission attempts when using PACTOR or WINMOR? 26. In which direction or directions does an electrically small loop (less than 1/3 wavelength in circumference) have nulls in its radiation pattern? 27. What precaution should you take whenever you adjust or repair an antenna? 28. Which of the following are examples of the NATO Phonetic Alphabet? 29. On which of the following bands is image transmission prohibited? 30. What effect does transmitter duty cycle have when evaluating RF exposure? 31. What problem can occur when making measurements on an antenna system with an antenna analyzer? 32. What is the voluntary band plan restriction for U.S. station transmitting within the 48 contiguous states in the 50.1 to 50.125 MHz band segment? 33. What could be a symptom of a ground loop somewhere in your station? 34. With which of the following conditions must beacon stations comply? 35. If the SWR on an antenna feed line is 5 to 1, and a matching network at the transmitter end of the feed line is adjusted to 1 to 1 SWR, what is the resulting SWR on the feed line? Warning! You skipped 0 question(s). Log in to set preferences.